Евстигнеева Е.А. Опыт невидимого, или "мужество субъективности"
This article is dedicated to the analysis of the experiencing of «invisible» things (things that we cannot touch, measure, prove like freedom, god, spirituality, meaning etc.) The author turns to the idea of phenomenology in his attempts to figure out what is the role of a subject in the process of gaining an experience of that kind: why some people are able to see, and the others look but cannot see? What does “phenomenological experience” mean? What does “phenomenon” mean? How does subjectivity get involved in the knowledge process? What skills are necessary for gaining a subjective experience and what characteristics does a subjective experience have? How do subjectivity and reality correspond? This article tries to answer these questions. Keywords: phenomenology, subjectivity, experience, phenomenon. To sense what is right? An introductory attempt is made in determining what is right through formal criteria, and subsequently by means of coordinates from the cultural-anthropological matrix of the Judaeo-Christian occident. Here, the distinction between the Aramaic concept of the word (Memra) and the Greek word Logos is essential for the comprehension of that what is right (and of the person). The term Logos situates what is right closer to reason, while the Aramaic rather dwelled on the domain of speech. This background creates a bridge towards comprehending the essence of the human being as well as the thereof derivable personally right, which is then reflected upon from the phenomenological perspective of Existential Analysis. In the process, particularly the manifestation of the person in terms of (internally speaking) accordance is dealt with, since the fundaments of moral behavior based on conscience are seen therein. The practical access and the mode of experience are then described in accordance with this insight. In the fulfillment of existence however it is not possible to comply with an absolute Claim on the rightness of decisions. An example of a psychotherapeutic reflection on an ethical dilemma elucidates what can be done to enable a non-alienated, existential course of life through an anchorage within the inner, authentic self. Keywords: ethics, conscience, logos, morality, person. 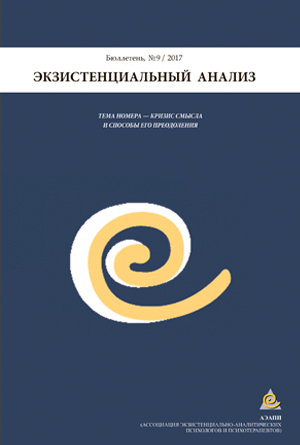 Following a short introduction into the body-corporeity problem in the anthropology of Existential Analysis, this article deals with the body-corporeity-dialogue as an access to the phenomenon of "inner coherency", which is regarded as the source of ethical attitude. In the process, the concepts of osteopathy (tissue dialogue) and Existential Analysis (incorporated self) are presented. We focus on the following question: aside from oral expression, how can a dialogue with hands, through listening tactility and touch, contribute to connecting with this source? Which ethical implications does a corporeity-oriented approach have for the therapeutic relationship? Thereby, a central exercise is presented which creates conditions, opens up a space of experience and indicates a direction as to where from an answer might appear. This deepens one's own feeling-consciousness, which becomes apparent in growing confidence and in the meaning of the corporeally pereeived experience. Through this deepened phenomenological Integration of body-corporeal experience new margins of freedom in therapeutic treatment can evolve. Keywords: incorporated self, body, body-corporeal dialogue, corporeity, phenomenology, coherence. The specific of the notion of the experience how it is understood by Rogers and Gendlin is shown and the definition of the experience limited by the structure is given. Five different levels of the client’s experience limited by the structure and five forms of the quality of the relationship experienced by a psychotherapist corresponding to these levels are described. The described levels are referred to the different methods of client-centered therapy and Focusing and to the concrete interventions stimulating the process of a client’s self-exploration. Keywords: experience, liveliness, felt sense, active listening. The results of the research on the transformation of experience of closeness in the process of learning Argentine tango are presented in the article. Due to phenomenological analysis of the dancers’ experience the detailed examination of the process of the experiencing of closeness during the dance and personal abilities developing through this process became possible. Research covers the potential of the using Argentine tango as a basis for creating various therapy programs. Keywords: contact, closeness, meeting, relationship, personal development, dance therapy. Placed in a context of the psychological problem of human «Self», present study describes lucid dreaming as an altered state of consciousness, where personal feeling of «Self» is experienced as a source of autonomous, subjective activity. Viewed results indicate that intuitive feeling of «Self», which provides basis for a personal, subjective activity, is not entirely a hypothetical concept, created by the European culture, but also an empirical fact, related to the very essence of human being. Keywords: phenomenon of human ego, subjectivity, self-identity, lucid dreaming. The phenomenon of burnout has a great frequency in the sphere of the performance of parental duties, as well as in the professional sphere. The portrait of the parents having burnout is presented. 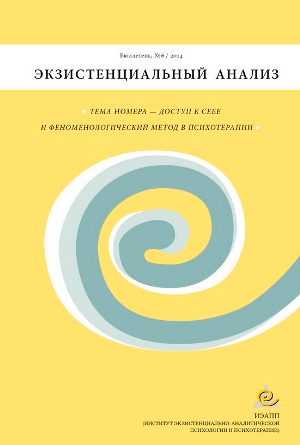 The results of the research of parental burnout with the help of Existential Scale questionnaire (ESK) and Test of Existential motivations (TEM) are presented and the connection between the degree of burnout and the existential fulfillment is shown. In this contribution the individual counseling for the patients having burnout structurally based on TEM-questions is introduced and the examples of the conversations are presented. Keywords: burnout, parental burnout, ESK, TEM. In an empirical study the phenomenon of insight is examined from the perspective of subjective experience (diploma, Department of Psychology of Lomonosov's Moscow State University, 2014). We compared the accompanying feelings in the process of solving conundrums by two groups of subjects: with normal and deficient vitality. For the explanation of the empirical data phenomenological method (A.Geordgy) and Personal Existential Analysis (A.Laengle) are used. The results show that the both groups demonstrate the same cognitive understanding and positive value of insight for life. Also, all the subjects feel joy and their self-esteem increases in the case of finding the right solution. However, when the problem is not easy to solve, at the stage of prejudging the respondents with normal vitality feel the excitement, challenge, high concentration, and the respondents with a deficient vitality do not mention such feelings. The subjects with the deficit of vitality are distracted by doubts about selected solutions, it plays a decisive role in the process and for the result of the solution, and consequently they don’t experience life as a value, instead of this they experience themselves as good or bad. All high-vital participants notes the positive impact of insight on a charger power and on emotions; on the contrary, the “deficient” subjects did not experience any feelings on the bodily level, the majority of the participants did not feel the significance of the experience of insight for the subjective assessment of life as a high-value. Keywords: insight, phenomenological method, subjective vitality. The article deals with the generalization of experience in organization consulting. The goal of the paper is developing of additional ways to motivate staff in accordance with the existential-analytical structural model. Comparison of the traditional model of employee motivation in cross-functional organizational structure companies with this existential-analytical structural model is realized in order to find out disadvantages of the first one. Describing of the newly developed methods of motivation and management structure of conversations for different groups of employees is added in accordance with the identified deficiencies in the traditional motivation model. Keywords: existential fundamental motivations, phenomenology, employee motivation model, cross-functional organizational structure. The general characteristics of the role of the inner consent in the process of negotiations are described. The stadiums of the process of negotiations are regarded from the point of view of the inner consent searching method. The other methods of Existential Analysis which may be applied during the process of the training and holding negotiations are enumerated. The conditions which are necessary for the achievement of the inner consent in the process of negotiations including organizational systems are marked. Keywords: Existential Analysis, fundamental motivations, inner consent, negotiations. The article is dedicated to the research of four categorical ways of understanding of the person defined as "anthropological concepts". It is investigated in philosophical-anthropological, historical-cultural and historical-philosophical perspectives. The author allocates such concepts as "Self", individuality, subjectivity and personality, showing need for the social humanities, including existential psychotherapy, to consider their distinction in anthropological analytics. Keywords: anthropological concepts, "Self", individuality, subjectivity, personality.